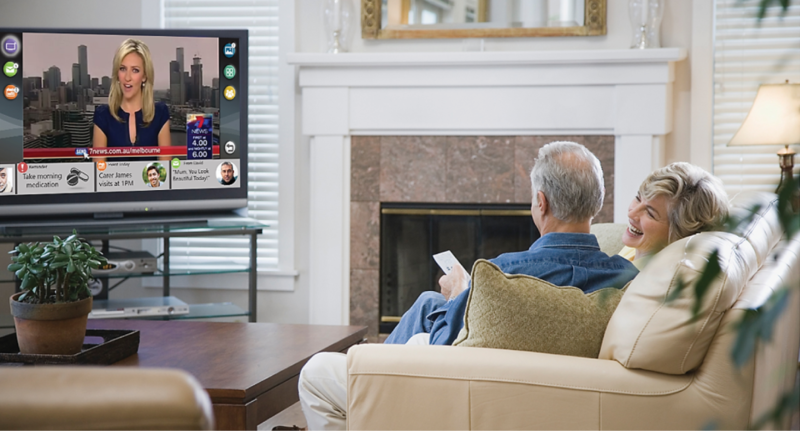 CareVision has launched a new interactive technology involving the humble TV and the internet which could reduce the rates of social isolation amongst the elderly. There are more than 20% of Australians over 65 are socially isolated and this number is increasing rapidly as the population structure of Australia becomes more and more top heavy. Research shows that socially isolated individuals are 64% more likely to develop dementia, twice as likely to have a fall, and makeup almost 40% of cases of avoidable hospitalisation in Australia each year. Preventing social isolation of the elderly in our community is one way to reduce the burden on the local health system. With the NBN rollout well underway there is now, more than ever before the opportunity to leverage internet enabled technologies to address these challenges. Irene Ryan, CEO and a founder of CareVision set out to create something that would improve individuals lives, reduce social isolation and help shape a better future for aged care, and the health system in Australia. “We realised early in our research that the only way to successfully engage older people in technology was to bring the technology to a platform they are already very comfortable with, not force them to learn new behaviours such as using a computer” Irene said of the decision to centre their technology platform for the elderly around the TV. According to Neilson Research older people watch on average 5.6 to 7.8 hours of TV per day. Having overcome the challenges of usability and acceptance by older people, CareVision delivers reminders and alerts for daily living activities, improves medication and therapy compliance, offers information about local social or community events, gives individuals the ability to request support, as well as a range of interactive games and entertainment and the joy that comes from sharing precious moments with their families through secure family communications and photo albums. In recent trials conducted by CareVision participants felt more in control of their daily lives due to the calendar and friendly reminders, and many reported improved mood, less stress, or lower anxiety levels. Family members are also empowered with information and communication channels through the CareVision mobile applications, giving them the information and peace of mind to comfortable about their parents or grandparents ageing in place as they go about their lives. CareVision will continue to transform the technology landscape for ageing people and aged care, and our communities, families, aged care and wider healthcare systems will benefit. How to Build Growth into your Aged Care and Home Care Organisation?